If a high-brow, traditional wedding invitation doesn’t float your boat or if you’re looking for something to match your vibrant and bubbly personality, look no further! This cute design is a breath of colourful fresh air from Paper Themes! Designed as a modern pocket wallet design, those of you who like everything to be organised with very little fuss will love this set up; not only is Follow Your Heart a delightful wedding invitation, it also features two extra slips that fit into a little inside pocket – an information card and an RSVP card. Perfectly organised, your guests will find it super easy to find all the information they need for your big day. No misplaced RSVP cards here! Printed onto luxury textured board, the wallet boasts a sophisticated marble effect which provides an interesting background for the main focal point, a fun collection of floating balloons. 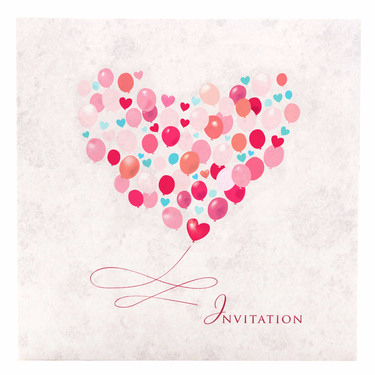 Comprising of different sizes and colours, the balloons collectively form the shape of a love heart for that all important romantic vibe, whilst little colourful hearts mingle with the balloons for a playful and eclectic feel. The Follow Your Heart colour palette will lend itself well to a variety of colour schemes and could also provide inspiration to those of you who have yet to decide on a colour palette. Decorate your venue with heart-shaped balloons and you’ll have the beautifully synchronised wedding of your dreams!